ACT UK is a fund which was created by His Grace Bishop Vahan Hovhanessian, with the blessing of His Holiness Karekin II, Catholicos of All Armenians, with the purpose of supporting the activities of the Armenian Church in the UK and abroad. Its objectives are set by the Trustees and the Executive Committee. The Trustees comprise of a representative of each of the parishes in the Diocese, and the beneficiaries of the funding are usually the parishes in the UK and Ireland. 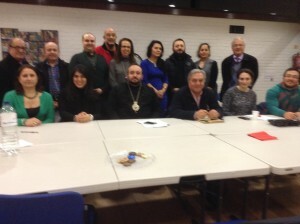 ACT UK funds projects such as Mission Parish Outreach, Deacon’s Training, the Primate’s Office and information services (including a weekly e-magazine and maintenance of the Diocesan website), Bible studies, Armenian Street Festival, ACYO, pilgrimages, promoting ecumenical relations, lectures and workshops. ACT-UK will be the umbrella fund of the Armenian Church in the UK, within which assets/funds will be allocated by individual donors. The long-term investment purpose of ACT-UK is to earn sufficient returns through time to support stable and growing income distributions from each individual fund to its designated beneficiary, while preserving and enhancing the principal balance of each such fund. ACT-UK seeks to accomplish this objective by aggregating the individual funds and investing them collectively in a broadly diversified portfolio managed by qualified investment managers. Individuals and business can donate directly to the general fund or establish special endowments within the ACT-UK umbrella fund in the donor’s name or the name of a family member and restrict the usage of the fund to any specified and particular project or programme within the mission and objectives of the Armenian Church in the UK and Ireland. ACT UK Trustees: Bishop Hovakim Manukyan, Hovnan Hambartsumyan, Viken Haladjian and Alan Simonian. Charity – Single Donations, please click here , complete and return to the Primate’s Office. Charity – Multiple Donations, please click here , complete and return to the Primate’s Office.